In 2018, Los Angeles City Attorney Mike Feuer reached a landmark settlement with Canoga Park-based homecare provider Emelyn Entino Nishi and her company Health Alliance Nurses Corporation after allegedly committing up to $9 million in wage theft from more than 200 private in-home caregivers. 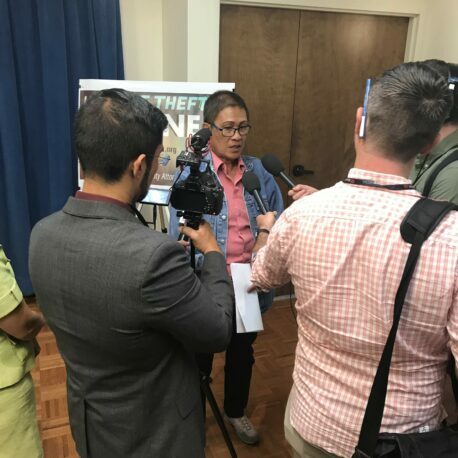 The settlement culminated a three year campaign led by the caregivers of the Health Alliance Nurses Corporation, the Pilipino Workers Center, and the California Domestic Workers Coalition to bring justice for the workers. This is the largest scale case of enforcement of the California Domestic Workers Bill of Rights to date. Josephine Biclar, one of the caregivers who joined the campaign, was paid as low as $4.50 per hour by Health Alliance Nurses Corp. She worked 24-hour shifts with the agency and was forced to falsify her timesheets so that she could not qualify for overtime. The Health Alliance victory sent ripples through the private homecare agency industry and affirmed that the California Domestic Workers Bill of Rights is real and ready to be enforced. The victory for the Health Alliance caregivers was just the beginning. Building on the momentum of this victory and affirmation of the California Domestic Workers Bill of Rights, we are ready to take our impact to the level of the entire homecare industry. By joining together caregiver worker organizations, employers, and other strategic partners, we seek to promote compliance with existing labor laws in the private homecare industry and promote dignified and fair working conditions for in-home caregivers. Formation of a Homecare Roundtable: Establishing a network of caregiver and homecare advocates across the state to share information, exchange lessons, and build our analysis of the homecare industry. Mapping Out Agencies: Building our analysis of the industry by documenting and centralizing information about homecare agencies, especially workers rights’ violators. Waging Campaigns Against Bad Actors: Supporting workers to file wage claims and waging campaigns against bad actors in the industry that are violating the rights of caregivers. Organizing Consumers: Activating consumers and families that hire through private homecare agencies to be our partners and to patronize agencies who comply with the law. Link to guide. ONE: Educate Yourself: The first step is to know your rights as a worker and your obligations as an employer. Learn about labor laws and the rights of private in-home caregivers. TWO: Be a High Road Employer: Whether you hire privately or through an agency, we all must make sure we are treating our workers fairly and with dignity.